Woodie Hill is a beautiful wooded property near Green Pond in Colleton County in South Carolina. 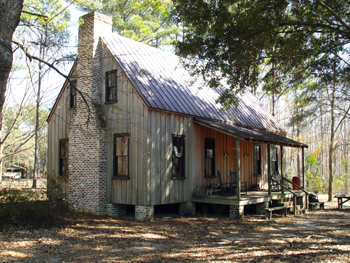 Woodie Hill is a beautiful wooded property near Green Pond in Colleton County. Improvements include a small pond, a tastefully designed 1435 sq. ft. cabin with pecky cypress paneling, high ceilings, large fireplace and loft. Secluded in natural woodlands near old rice fields, Woodie Hill is a unique property located in the heart of the famous ACE Basin plantation neighborhood between Charleston and Savannah. It would appeal to any sportsman or nature lover.